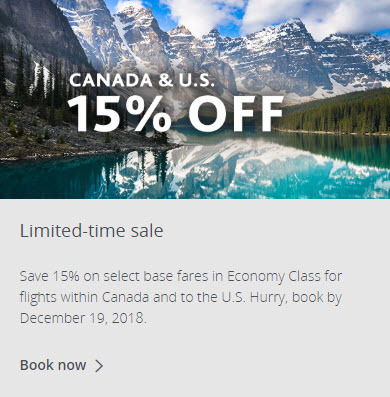 Save 15% on select base fares in Economy Class for flights within Canada and to the U.S. Travel until March 31, 2019. Hurry, book by Wednesday, December 19, 2018. Book by December 19, 2018 at 11:59 pm from your city of departure in Canada. Travel valid from December 24, 2018 – March 31, 2019.